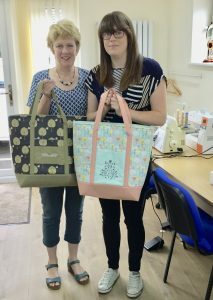 Mum and daughter Jill and Stephanie Grant have just completed a two day holiday sewing break. Read about their experience below. Thank you very much for the last couple of days. We both thoroughly enjoyed it & felt we learnt loads! We’re both encouraged to go on & do more now, which is great. Once again many thanks for a great few days & hopefully we might meet you again sometime. 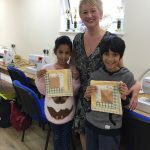 Their goal was to become familiar with a Bernina 630 embroidery/sewing machine passed on to them by Jill’s mum. 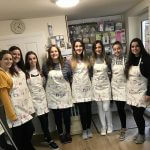 Having done little sewing themselves prior to their visit, we devised a program that would incorporate both the embroidery functions and the utility stitches of the machine, during their sewing break. 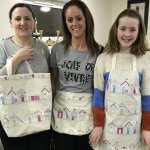 Combined with the use of our Janome class machines they experienced a very industrious two days which including designing and drafting a tote bag pattern. The bag included a contrast base and embroidered pocket inserted between the front straps. 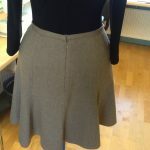 it was then padded and lined. Both bags were made from the same design of pattern but look totally unique, a true example of personalisation and look absolutely stunning I’m sure you’ll agree! 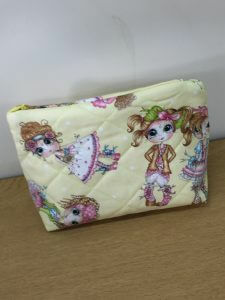 Not content with that, Jill and Stephanie then made a cute little cosmetics bag with invisible zip, (the insertion quite a challenge for a novice project!) This was also quilted and lined. it was a pleasure to see how they both grew in confidence over the two days and I’m sure this will continue in the future. Well done Jill and Steph! 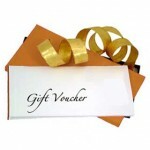 Check out our specialist workshops for details of private tuition course and holiday breaks.